What to do During an Electrical Outage? (SPRINGFIELD, IL) –Weather, accidents, and storms can disrupt the electricity we are so used to having. Sometimes electricity flickers momentarily then comes back. Serious damage to power lines and the electrical grid can cause outages for days, or weeks. Safe Electricity has valuable information to keep you safe and comfortable during a power outage of any length. Don’t panic! Check to see if your neighbors still have electricity. If they do, the problem could be inside your home. Check your main fuses or circuit breakers to see if they have blown or tripped. Replacing a fuse or resetting a circuit breaker may restore your electricity. If the problem is not in your home, call your electric supplier. A repairperson will be dispatched as quickly as possible. Your supplier should also be able to tell you if it will be an extended outage. Unplug appliances with electronic components, such as microwaves, televisions and computers. This will help to eliminate damage to your appliances from voltage surges when the electricity is restored. Wait a few minutes before turning on these appliances when the electricity is restored. This will reduce demand on the power supplier’s electrical system. If you use a standby generator, be sure it has been installed and wired properly. If improperly installed, a generator could cause dangerous conditions for the utility supplier’s employees working to restore the power. Your generator could be damaged when the power is restored if a double throw disconnect is not used and properly installed. Of course, it is also important to be sure that a fresh supply of fuel to power the generator is on hand and stored properly. To make an outage easier to cope with, keep an adequate supply of the following on hand at all times. These should be kept in a cool, dry place and all members of the family should know where to find them. Check the basement periodically for flooding. You can use a portable, gasoline-powered pump to pump out a basement or crawl space when the power is interrupted to an electric sump pump. Never wade into a flooded basement unless electricity supplying sump pumps, freezers, etc. has been disconnected. The power may be restored while you are in the flooded basement and the motors on these appliances may be submerged. 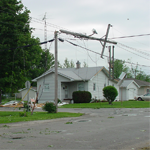 Never go near downed power lines; let qualified people from the power supplier handle these situations. Keep freezers and refrigerators closed, to keep food fresh. Frozen food is generally safe to eat if there are still ice crystals on it. Wrap blankets around the appliances to provide extra insulation. Bottled water, canned soda and juices eliminate dependence on the refrigerator if stored in a cool place. Dress comfortably and use natural ventilation to keep your home cool. If the health of family members is a concern, find consider staying with friends, or in a community center where electricity is available. Your electricity supplier should be notified if you use life support equipment in your home. Your home will be given priority. Dress warmly. Several layers of clothing provide better insulation than a single layer of heavier clothing. Move to a single room, preferably one with few windows. Ideally, this room should be on the south side of the home for maximum heat gain in the daytime. The room should be shut off from the rest of the house and could be one with a fireplace, wood stove or other alternate heat source. If you use an alternate heat source, be sure and follow operating instructions. For example if you use a kerosene heater, adequate ventilation is a must. All fuels should be stored outside of the home for safety reasons. Wood stoves and fireplaces should be maintained properly throughout the year to prevent problems when they are needed in an emergency. A primary concern in winter is keeping water pipes from freezing. A small stream of water can be left on to prevent this. This is not a practical solution when water is supplied from a well. Insulating the water pipes is a more permanent method. See the section on extended outages and home shutdowns for information on how to drain the water pipes of your home. In most rural areas electricity is required to pump water into the home. Since water cannot be pumped during a power outage, keep an adequate supply of drinking water on hand at all times. Consolidate your resources with neighbors. They might have heat and electricity in their homes. As in summer, people with health problems should be taken to a church, community agency or other location where their needs can be met. Unplug everything in your home. Turn off breakers or remove fuses. If there is an extended power outage, you may want to leave one lighting circuit on so you will know when the electricity comes back on. Winterize your water supply system completely. Be sure to disconnect the electrical supply to the water heater before draining. If the power is not off there can be damage to the elements in the heater. Drain the water system from the lowest possible point so there will be as little water as possible left in the pipes. Hot water heating systems should be drained unless filled with a nonfreezing solution. A call to your dealer or installer will tell you if it should be drained. The drainage system in the home also needs to be winterized. This is done by pouring antifreeze into the traps in the drains below the sinks, toilets, washing machines, etc. Recreational vehicle antifreeze is recommended because it is less toxic. Empty all food from freezers and refrigerators and leave the doors open. The food could be taken to neighbors that have electricity or to a food locker. Dry ice could also be used for a short period of time. The easiest solution may be to take the food outside if the temperature is cold enough. If your home is equipped with an electric heat pump, special care is needed when turning the unit on after an extended outage. It takes a period of time for the lubricant in the refrigerant to warm-up. This is approximately one and one-half hours per ton of cooling capacity. This could vary from brand to brand and a call to your dealer could prevent problems. During this compressor warm-up time, you should use the supplemental or emergency resistance heating elements of the heat pump to heat the home. Keep curtains closed except on south facing windows in the winter when the sun is shining. This will supply some passive solar heat in the daytime hours. Draperies should always be closed at night. Following these suggestions will make it easier to cope with a power outage. Think ahead and be prepared for an emergency by having a plan for your household. Remember to stay calm. The electricity will be back on as quickly as possible. Your electric supplier is working around the clock to restore your service.